1. Confirms the minutes of the meeting of the Regional Transport Committee, held on 3 December 2018, as a true and correct record. 3. 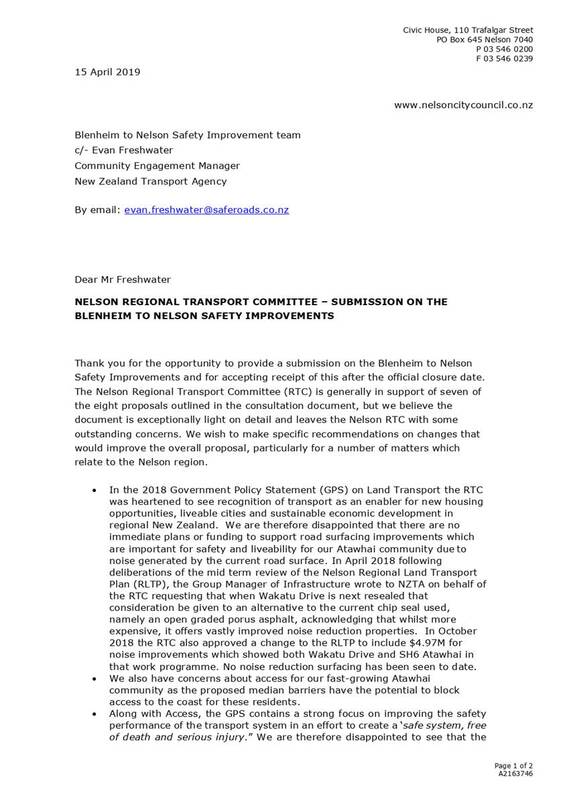 Delegates authority to approve any changes to the submission to the Blenheim to Nelson Safety Improvements consultation, based on feedback from the meeting, to Her Worship the Mayor and the Chair of the Regional Transport Committee. 1. 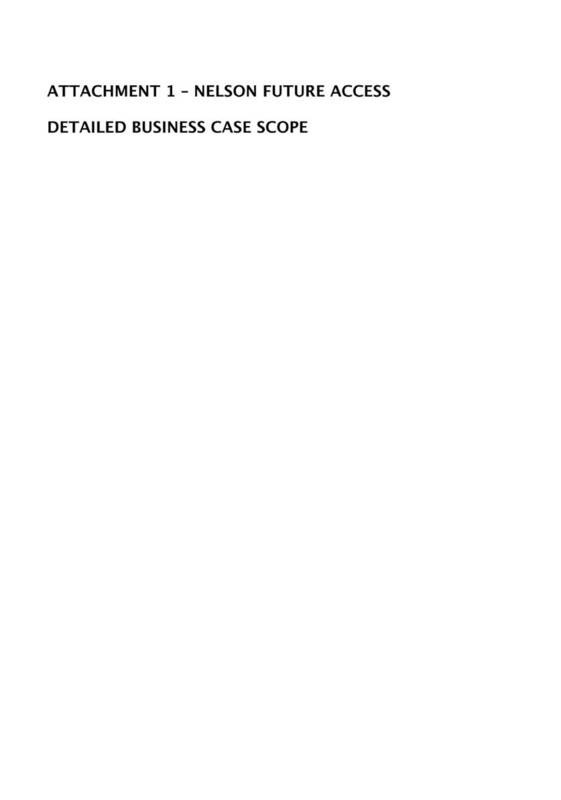 Receives the report Nelson Future Access Detailed Business Case Update (R10066) and its attachment (A2159036). 2. 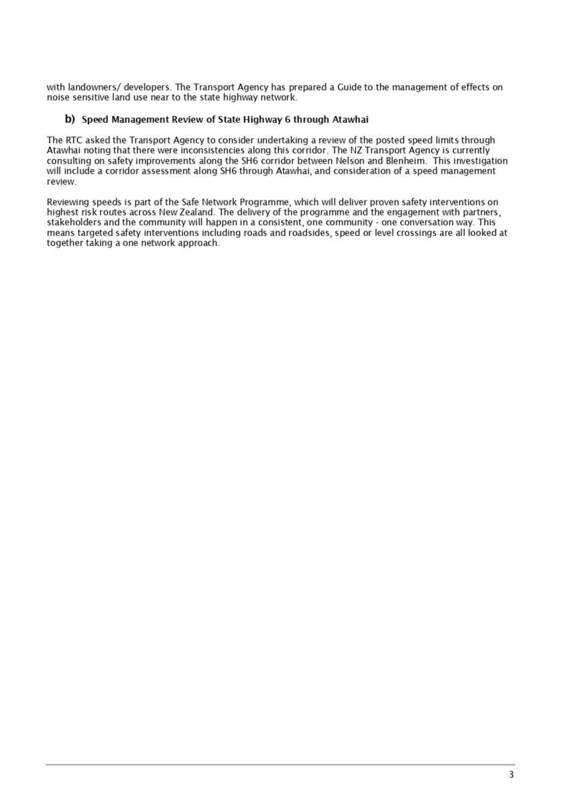 Approves the signing of the Memorandum of Understanding with the New Zealand Transport Agency (A2162709). On Monday 3 December 2018, commencing at 2.00p.m. 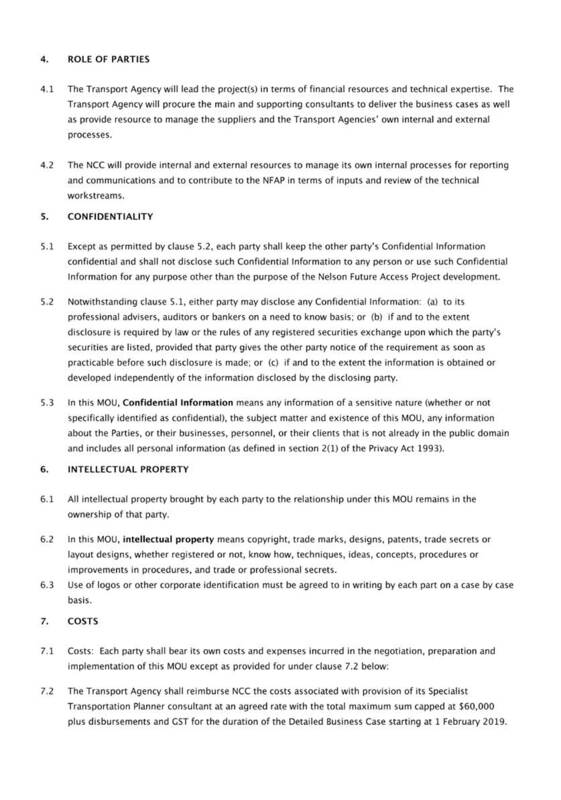 It was noted that item 10 would be considered as the very last item, following public excluded business. Mr Barlow thanked the Council for its support of the Biking to School initiative and gave background information regarding the Forum. In response to questions, Mr Barlow noted that the Forum had funding available to encourage behaviour change, and that they would be available to discuss collaboration with Council in regards to aligning active transport messages going to the community. Mr Olorenshaw gave a Powerpoint presentation (A2109055). The presentation showed Nelsust’s vision for Rocks Road. Mr Olorenshaw noted that the type of esplanade suggested was expected to help protect the road during surges that could occur in extreme weather events. 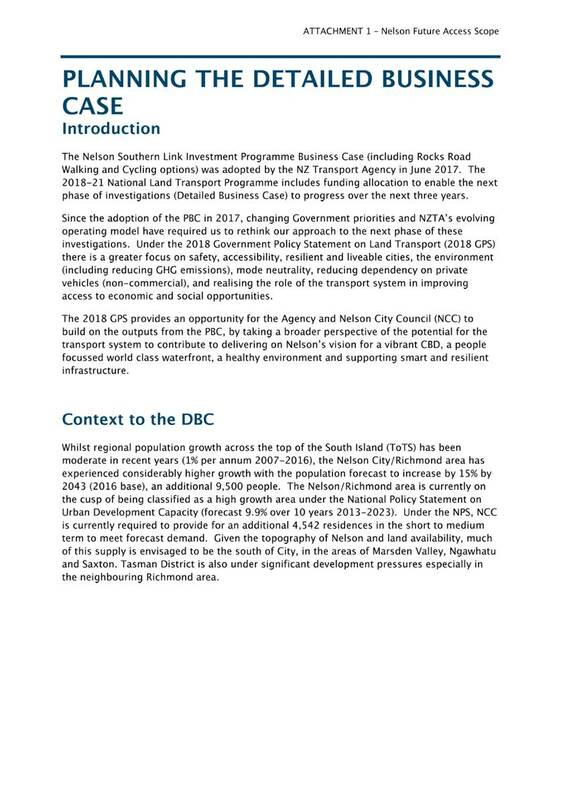 He also noted that he supported the Detailed Business Case to be progressed for the Nelson Southern Link and Rocks Road walking and cycling project. Document number M3801, agenda pages 7 - 9 refer. Confirms the minutes of the meeting of the Regional Transport Committee, held on 3 October 2018, as a true and correct record. A verbal report was given. The Chairperson thanked everyone involved in preparing the detailed business case document for the Nelson Southern Link and Rocks Road Walking and Cycling. He further noted that a list of projects was being worked through to assess if any were eligible to qualify for enhanced financial assistance rates. Receives the verbal Chairperson’s Report. Document number R9333, agenda pages 10 - 36 refer. Manager Transport and Solid Waste, Marg Parfitt presented the report and answered questions about anticipated timeframes for changes to occur if using the special consultative procedure. Mr Harland noted that the review of the 2018/19 rules programme would fall under the responsibilities of the Ministry of Transport, not the New Zealand Transport Agency. An addition to the resolution was made to support the Chairperson contacting the Ministry to request changes to this process. The meeting was adjourned at 2.54p.m. and reconvened at 2.57p.m. Notes the work undertaken by officers on speed related issues on Nelson City local roads. 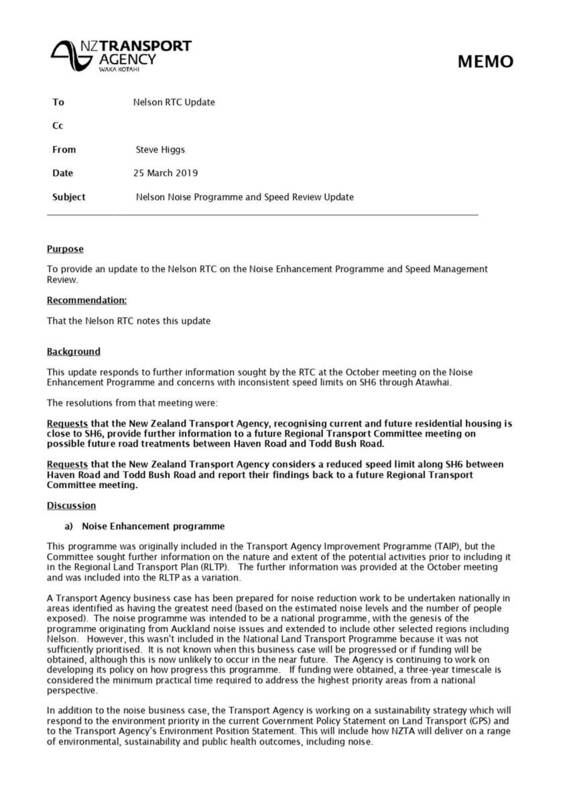 Supports the Chairperson of the Regional Transport Committee writing to the Ministry of Transport requesting changes to their speed reduction process (current 2018/19 Rules Programme) that will allow local authorities greater flexibility in trialling reduced speed limits. 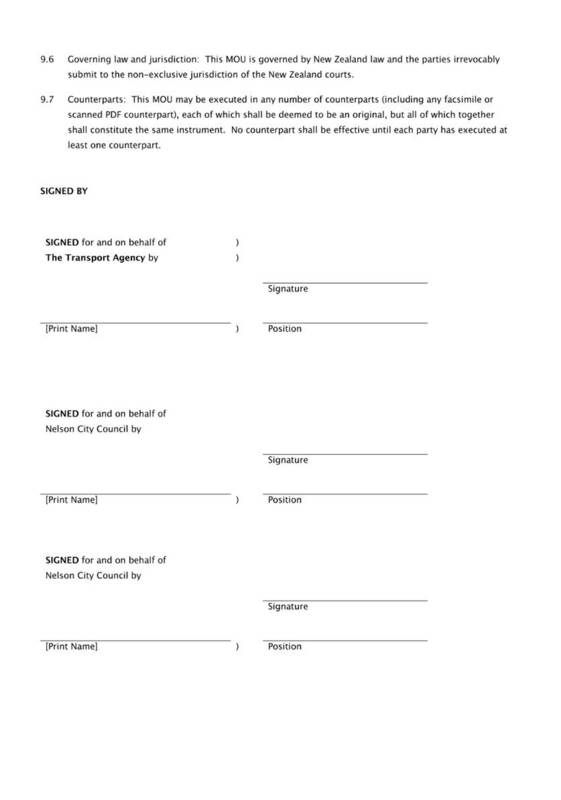 Document number R9768, agenda pages 37 - 40 refer. 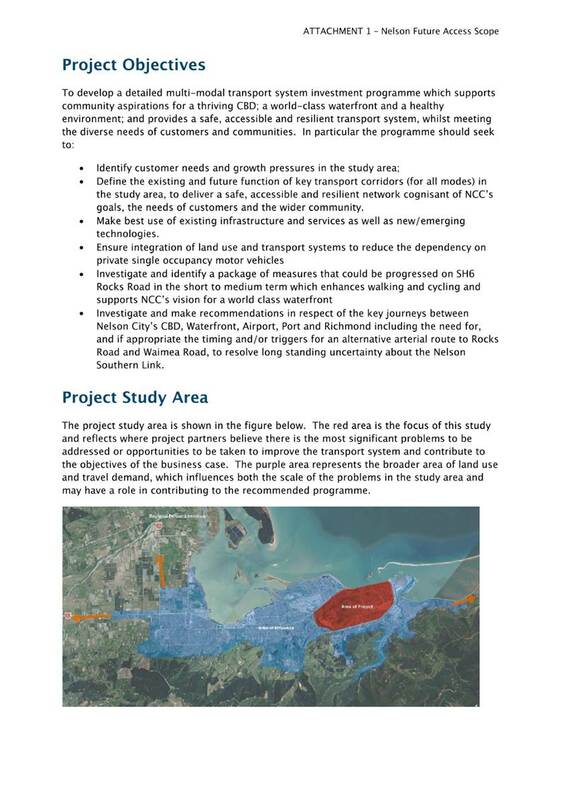 Approves a variation to the Regional Land Transport Plan 2015–21 to include Saltwater Creek Bridge as a specific project. Approves the inclusion of $1.2 Million in the Nelson Regional Land Transport Plan 2015–21 for Saltwater Creek Bridge in the 2018/19 financial year. Document number R9734, agenda pages 41 - 56 refer. 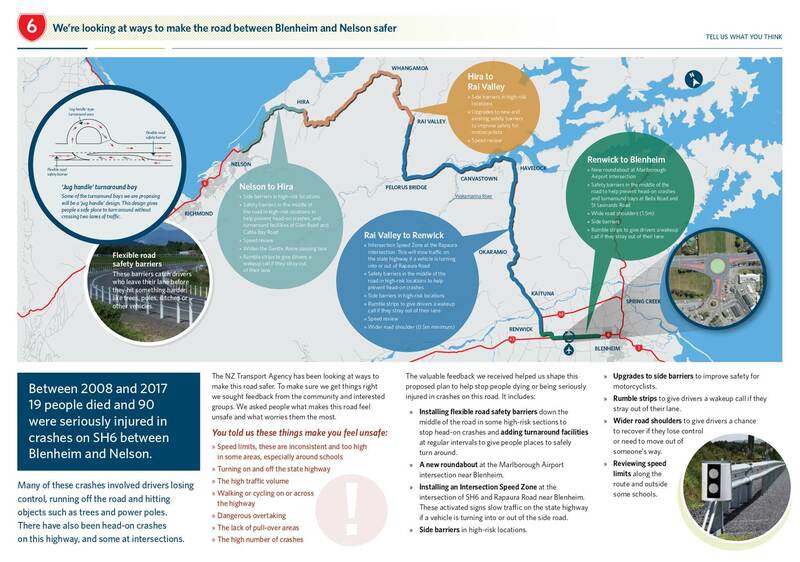 The report was presented by New Zealand Transport Agency representatives Jim Harland, Rhys Palmer (Project Manager), Jill Skinner and Coral Aldridge. Mr Harland gave a Powerpoint presentation (A2109344). He noted that the emphasis for the New Zealand Transport Agency was to have a robust process in place to inform the Regional Land Transport Plan (RLTP) 2021-2024 development in year 2020/2021. The meeting was adjourned at 3.34p.m. and reconvened at 3.50p.m. 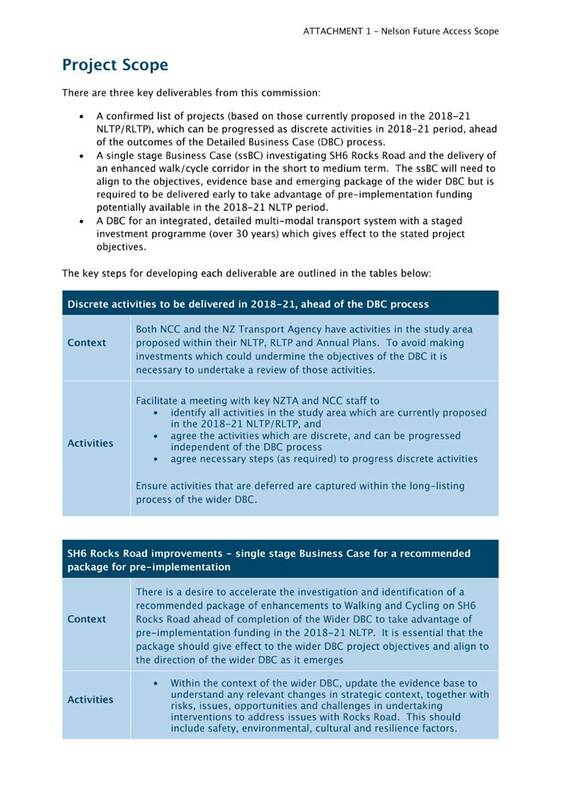 Discussion regarding the Detailed Business Case Scope took place and some minor amendments were suggested for agenda page 51, i.e. 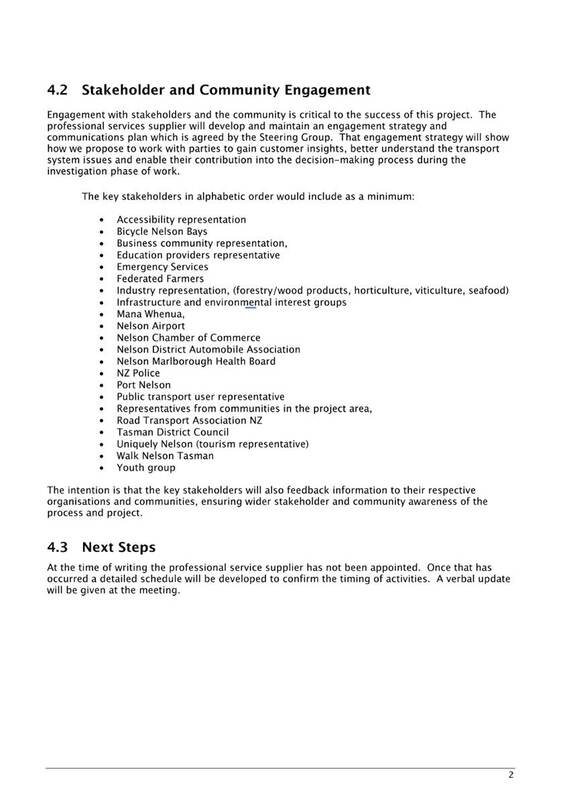 splitting the first bullet point on the page into two bullet points, and that NZTA considers adding their logo to the document. An addition to the resolution was made to delegate minor amendments to the Project Governance Group. Attendance: Councillor Matheson left the meeting at 4.18p.m. and returned at 4.21p.m. 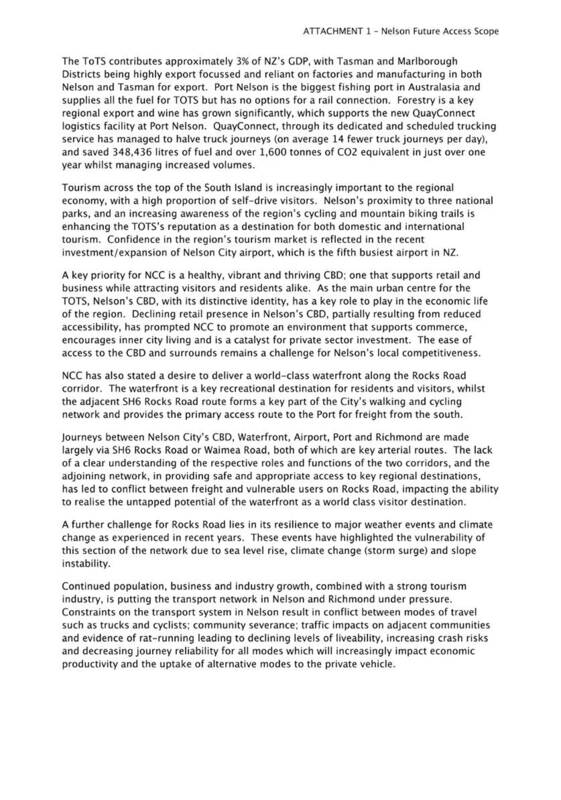 Notes that updates will be provided to future Regional Transport Committee meetings on progress of the Detailed Business Case of the Nelson Southern Link and Rocks Road walking cycling project. 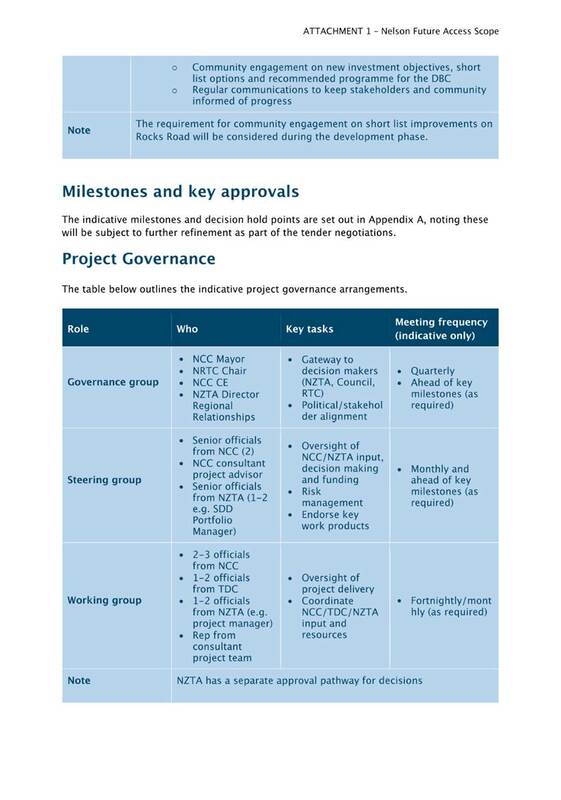 Delegates minor amendments to the outline scope for the Nelson Southern Link and Rocks road Walking and Cycling project to the Project Governance Group. 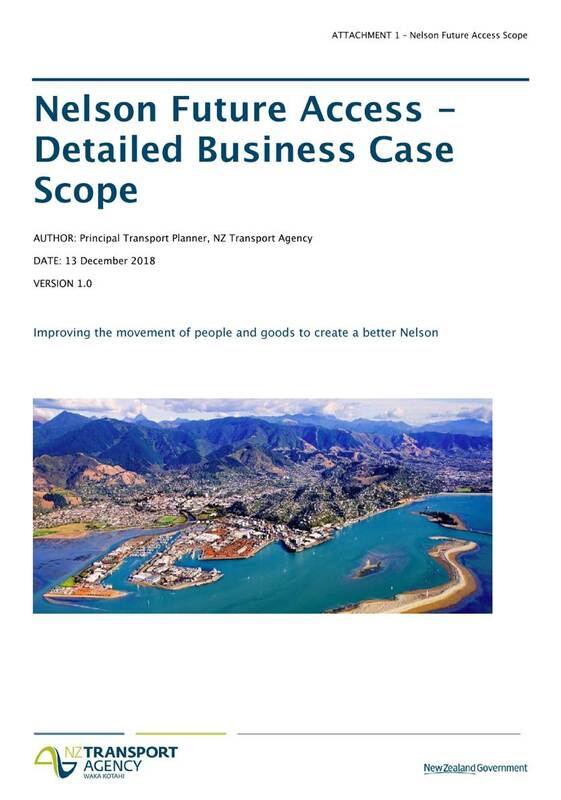 Endorses the amended outline scope for the Nelson Southern Link and Rocks Road Walking and Cycling project (A2102066 of Report 9734) that will enable the Detailed Business Case to commence. 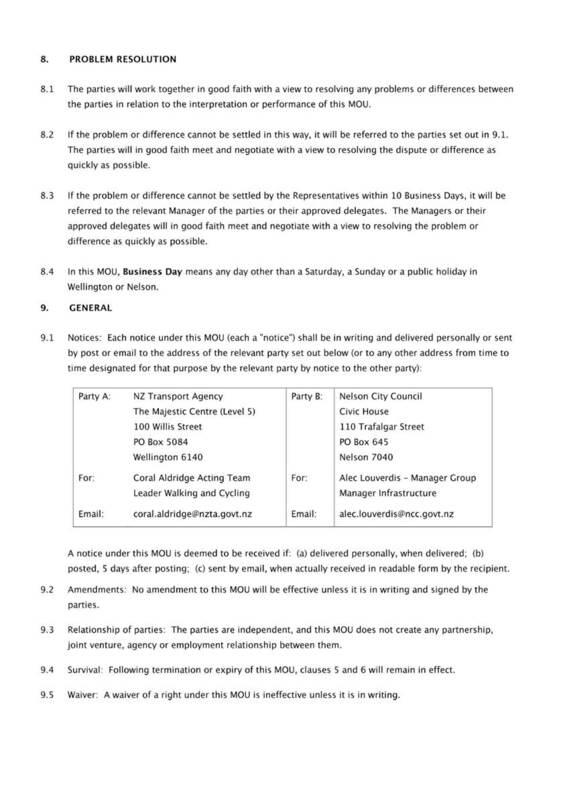 Confirms, in accordance with sections 48(5) and 48(6) of the Local Government Official Information and Meetings Act 1987, that Stuart Bryant and Drew Bryant from Tasman District Council remain after the public has been excluded, for Items 1 and 2 of the Public Excluded agenda (Public Transport Cost Adjustment and Electronic Bus Ticketing), as they have knowledge relating to these matters that will assist the meeting. The meeting went into public excluded session at 4.34p.m. and resumed in public session at 5.07p.m. Document number R9678, agenda pages 57 - 66 refer. Manager Transport and Solid Waste, Marg Parfitt presented the report and noted that the underpass was likely to be eligible for other NZTA funding in which case the funding required from Nelson City Council would be reduced. Attendance: Her Worship the Mayor Reese left the meeting at 5.11p.m. and returned at 5.15p.m. Discussion took place regarding anticipated impacts on traffic flow, noting the decision about exits onto Champion and Salisbury Roads as part of the development’s resource consent application had been made by independent commissioners. Attendance: Her Worship the Mayor and Councillor Matheson left the meeting at 5.20p.m. 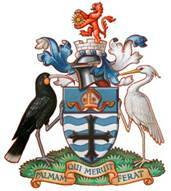 ; Councillor Matheson returned at 5.21p.m and her Worship the Mayor returned at 5.45p.m. Notes that the project will be managed entirely by Tasman District Council. Commits to the allocation of a maximum of $470,000 as a grant payable to Tasman District Council for the Champion roundabout and underpass project as part of the 2019/20 Annual Plan. Councillor Noonan asked that her vote against the above motion and the recommendation to Council, which were taken as one, be recorded. There being no further business the meeting ended at 5.51p.m. 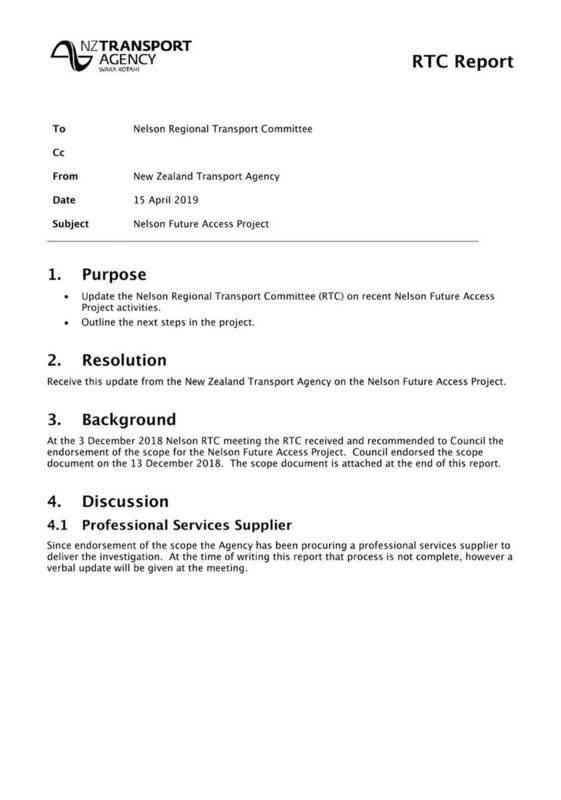 1.1 To provide the Committee with the New Zealand Transport Agency (NZTA) update report and seek approval of a submission in response to material provided. 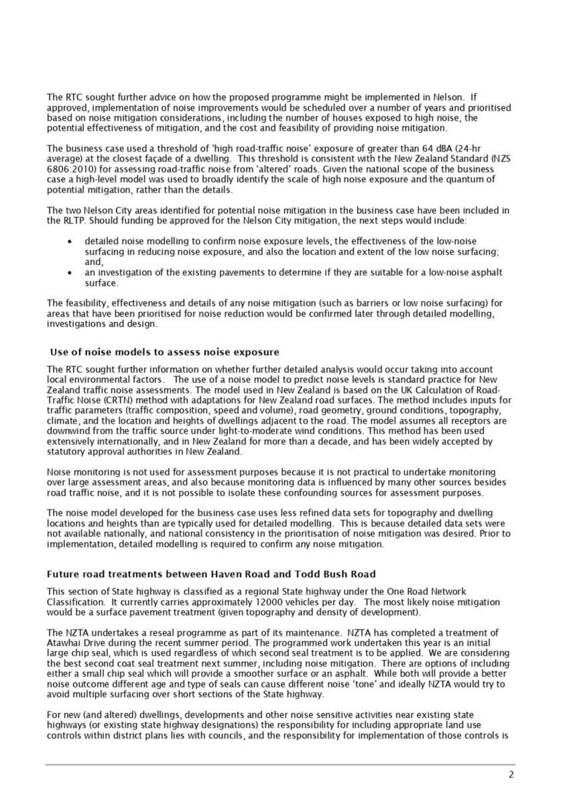 2.1 The NZTA’s update on issues relating to the Noise Reduction Programme and the Speed Review is summarised in Attachment 1. 2.2 Supporting information regarding the State Highway 6 Corridor Safety Investigation is appended as Attachment 2. 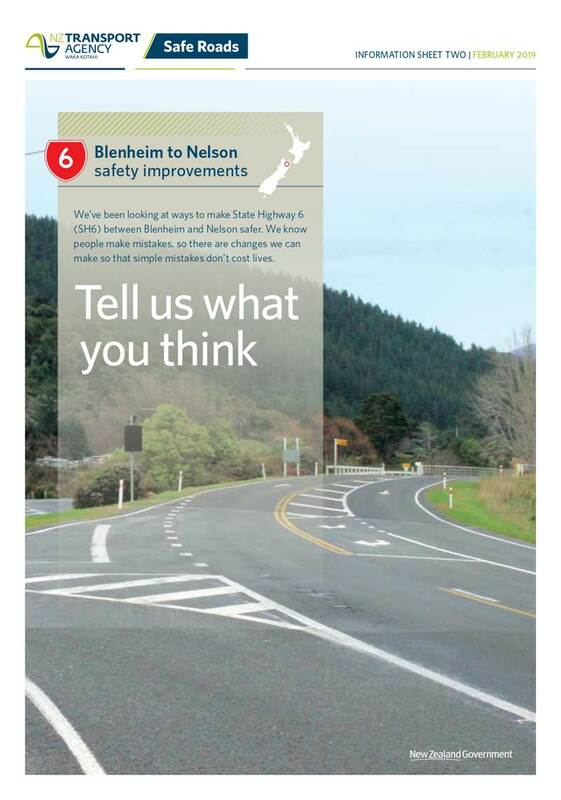 2.3 Feedback on the Blenheim to Nelson Safety Improvements consultation document has been invited from NZTA. NZTA officials indicated they are willing to accept late feedback from this Committee. 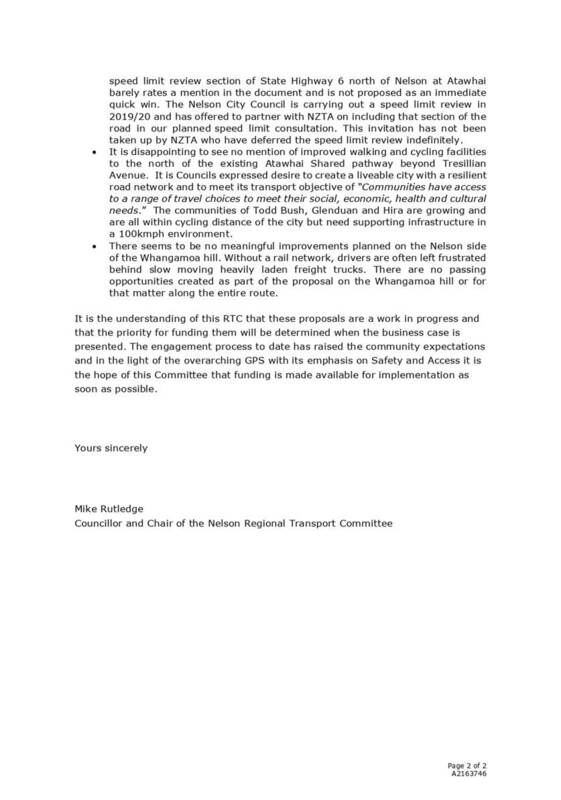 The RTC Chairperson and officers have worked together to draft feedback - appended as Attachment 3. 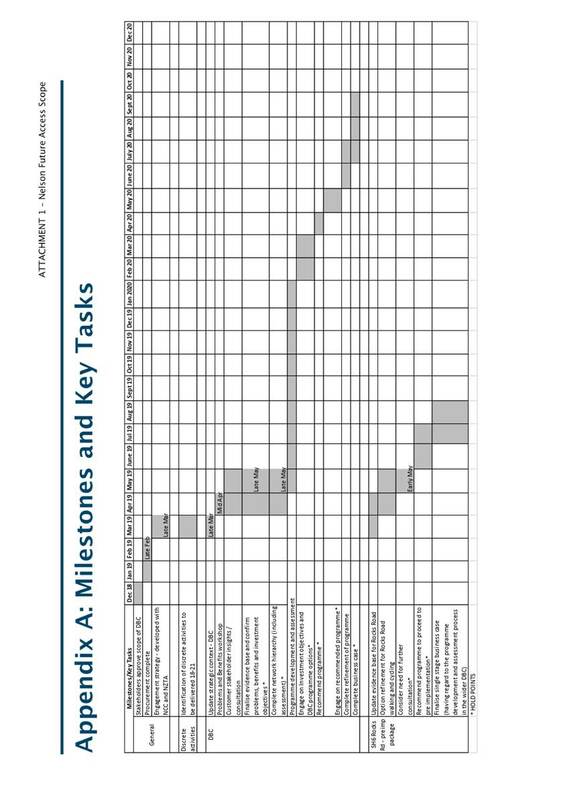 1.1 To update the Committee on the progress of the Nelson Future Access Detailed Business Case. 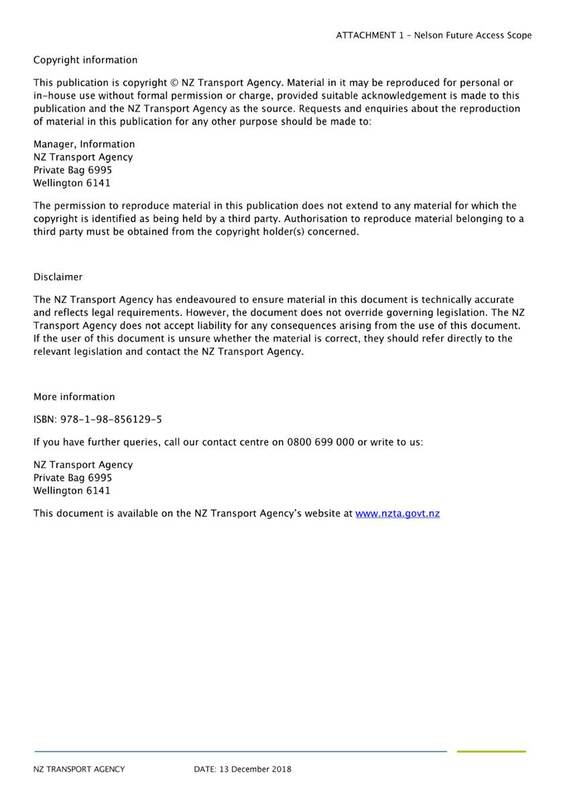 2.1 The update from the New Zealand Transport Agency (NZTA) is appended as Attachment 1, and for completeness includes the approved Detailed Business Case. 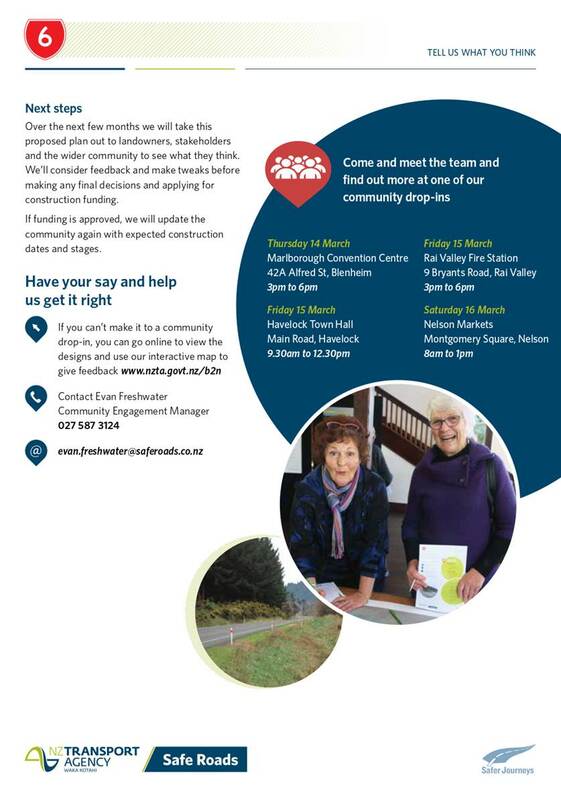 2.2 The NZTA project managers will be in attendance at the meeting to answer any questions and to provide any update further to their report. 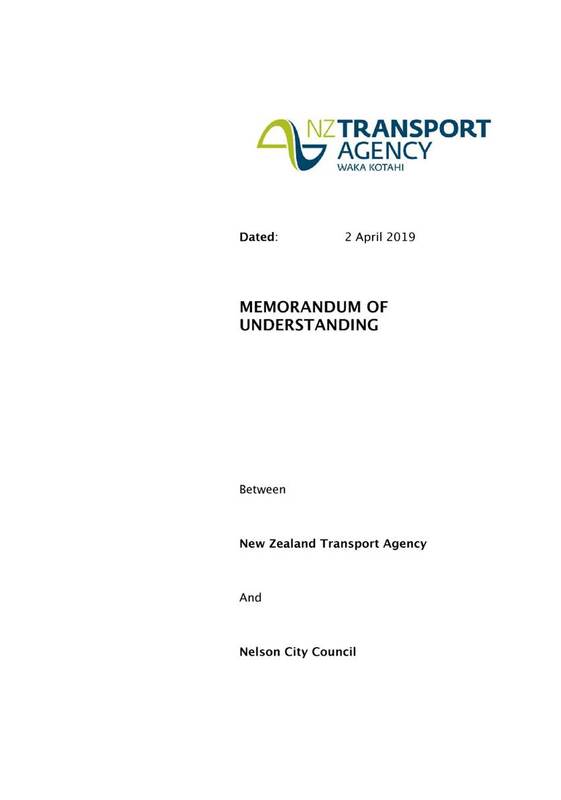 1.1 To approve the signing of a Memorandum of Understanding (MoU) required by the New Zealand Transport Agency (NZTA) on the Nelson Future Access Project. 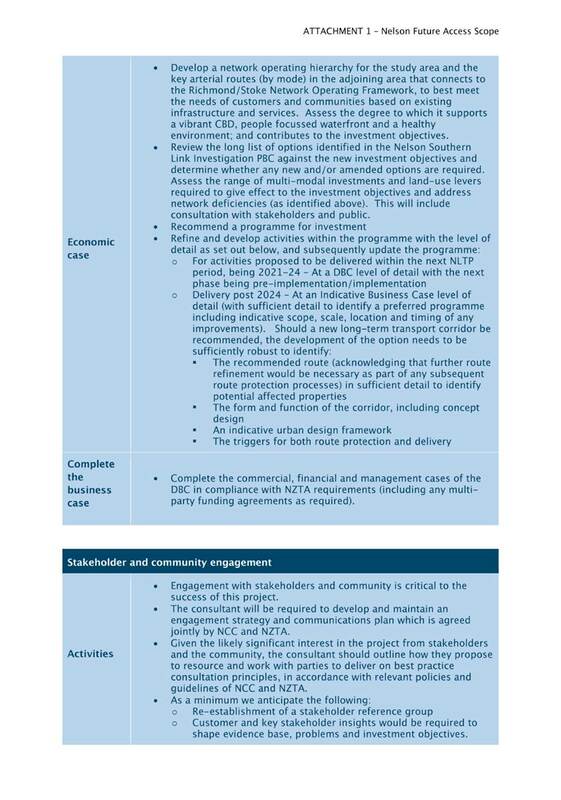 2.1 Following approval of the Nelson Future Access Detailed Business Case by Council in December 2018, NZTA have requested that the NCC enter into an MoU to document how NZTA and NCC are to collaborate on the Nelson Future Access Project. 2.2 The Draft MoU is appended as Attachment A2162709. 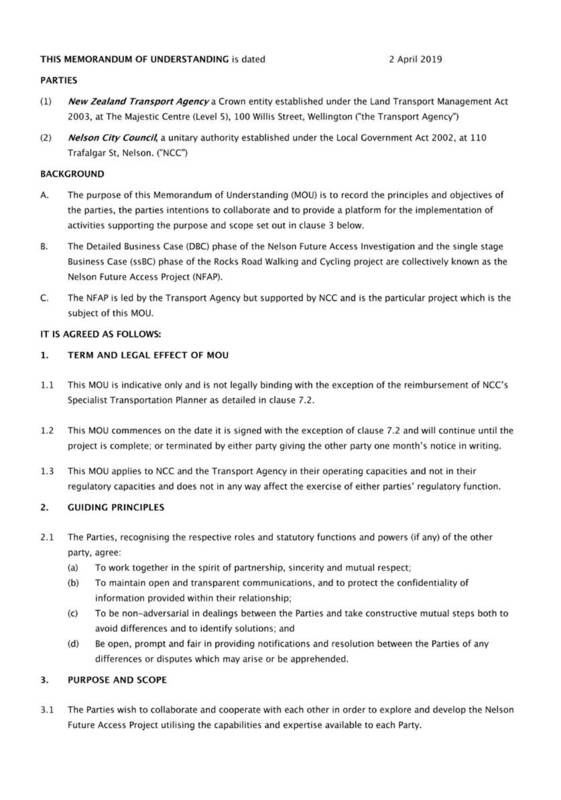 2.3 The Draft MoU has been reviewed by Council’s legal adviser and provided the content clearly reflects the intentions of the parties, she has no material concerns from a legal perspective. 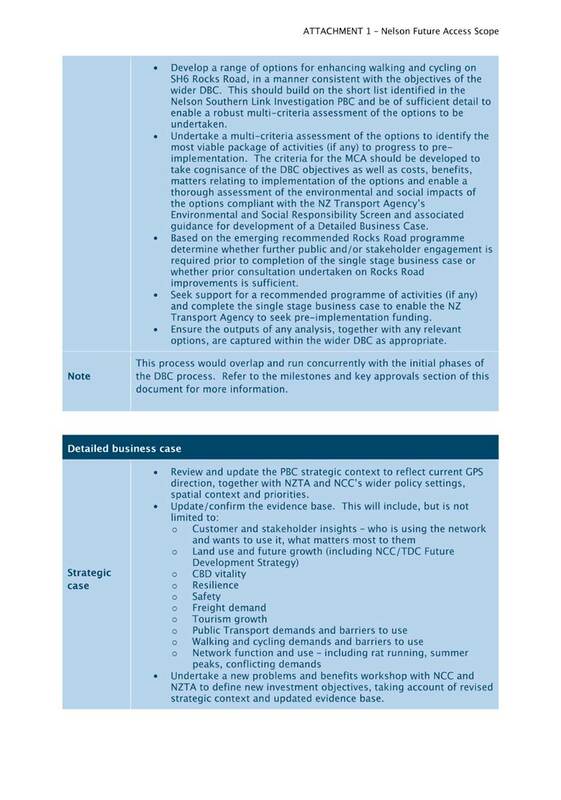 It is noted that the MoU is not legally binding, with the exception of the reimbursement of the NCC Specialist transportation planner costs, and in no way affects the exercise by the Council of its regulatory functions.